By Jim Dale; Directed by Richard Maltby, Jr.
Just Jim Dale. Photo by Joan Marcus. BOTTOM LINE: The talented and energetic multi-hyphenate will delight song and dance fans as well as Potterphiles. Jim Dale’s mellifluous voice has been heard by adults and children on probably six out of the seven continents courtesy of his work on the audio books for the seven Harry Potter novels. But the actor, singer and dancer is more than just the man who made the boy wizard and his 200 character universe come alive to listeners. Halfway to an EGOT, the Tony (Barnum) and Grammy-award winner (who also has an Oscar nomination) has been on the stage for 60 years, the highlights of his starry and storied years brought to life in his one-man show. Dale starts right at the beginning, recounting how even his birth was an entrance with his mother uttering “TADA!” to the nurses when he appeared. Back then he was Jim Smith, who would entertain his cousins on Saturday nights with British music hall songs and the jokes of old comics. He studied dance for six years (“I became the Billy Elliot of our school”) and got an early taste of the crowd eating out of his hands when he had to perform a pas de deux on his own when his partner didn’t show, and earned big laughs. He recreates the moment to hilarious effect. While still a teen he became a comedian and then a successful singer with a #2 song in England, eventually being signed by a pre-Beatles George Martin. But after seeing a Noel Coward play he gave it all up for acting. 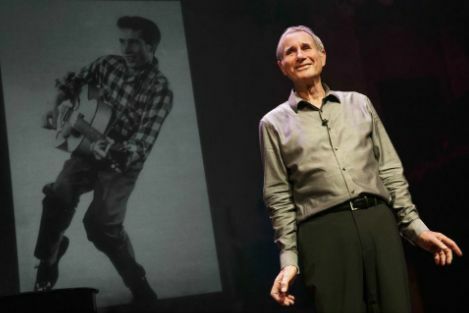 Along with some of his back story, Dale treats the audience to a number of his most famous songs including Georgy Girl (for which he received the Oscar nomination), There’s a Sucker Born Ev’ry Minute, and Museum Song, both from Barnum. Museum Song is based on the museum on lower Broadway Barnum founded and the tune catalogues all the many items housed there. Dale first does a slowed down version so that the audience can hear each item as he ticks them off, and then as it is brilliantly done in Barnum, so fast that it was hard to imagine when he took a breath. Of course Harry Potter (“f*%&ing Harry Potter” as he jokingly referred to him) wasn’t overlooked. For his first foray he said the booth had been so small it was like being in a coffin standing up. He demonstrates his physical comedy skills showing what it had been like trying to sit in the tiny space while being close enough to the microphone, not turning his head to read the pages and trying to keep his leg from jiggling noisily. At nearly 80 and looking quite fit, Dale moves like a man at least 20 years his junior. With only an accompanist (Mark York, also a co-arranger) sharing the stage, he works hard and steadily to entertain, keeping the show going at a breezy pace. By the end of the evening he has worked up a well-earned sweat. For this non-Potter fan who had only known Dale through his narration skills on the late lamented television show Pushing Daisies, even his corny jokes (“I thought of Shakespeare when I was thinking of a name for me son when he was born – Toby or not Toby”) landed with aplomb. Dale is an endlessly charming and engaging performer.